If you are finding work stressful or are finding it difficult because of a mental health problem, then your employer should be able to offer you support. 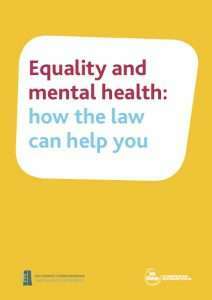 Under Equality Law, employers are obliged to make appropriate measures so that employees who have a disability, including people with experience of a mental health problem, can access, participate and advance in employment. All measures should be taken in consultation with the employee and should be reasonable for the organisation.